Hard to believe it has been five years since I made the outdoor curtains for my back porch and I am very happy to report that after all this time, rain, heat, washing and drying them every year, they are holding up very well. It was a project and a half! Not because they were difficult to make, but because I had to make eight very large curtains. Our porch in 12 feet high and each opening is 10 feet wide, so it took me about six whole days of cutting and ironing to finish the entire porch. These are the items I used to make the curtains. 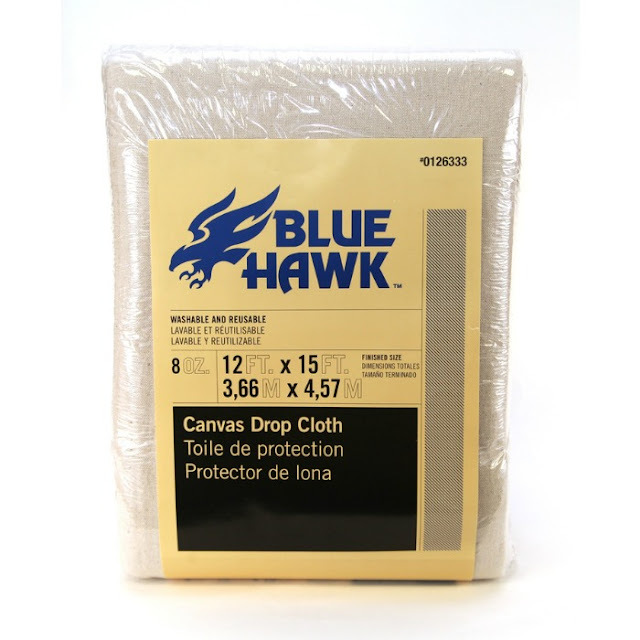 The canvas drop cloth I purchased from Lowe's. Lots of it! LOL I really liked this brand. The drop cloth color is very pretty and it is a little sturdier than others. has not come apart at all. I don't really have a tutorial to give you on how to make these curtains. They are very simple. Just measure your space, cut your fabric to the desired width and length, adding to those measurements about 1 1/2 inches on the sides and top for your hem and 3 inches for the bottom. I like my bottom hem to be a little wider. The biggest problem we had were the bars. We could not find anything that would fit those opening, so we had to fabricate some. We bought some regular iron rods and sprayed painted them ourselves. We used ring clips to hang them up and happy to report, those are also doing just fine. At first, I used decorative chain to secure them to the posts as you can see in the next few pictures. But it proved to be a mistake as soon as it got really windy, so I had to move on to plan B. Rope! The porch has changed many times over the years, but the curtains have stayed. I love the way they look and the warm feeling they give our porch either day or night. If you decide to tackle this project, my only advice is, be patient and make sure you wash your drop cloth before you start your project, because it will shrink. Believe me, I learned the hard way. Stop by and link your beautiful projects! These look wonderful! Thank you for sharing how you made these. I love your porch! It' so pretty! I need to make these for my porch too. I appreciate the inspiration! 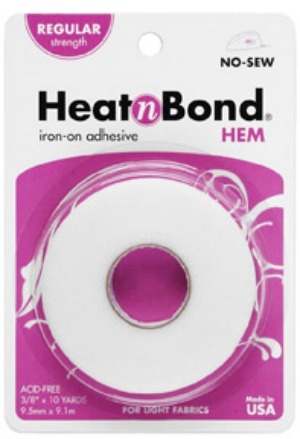 Thanks for sharing, now I have to add Heat Bond to my shopping list! They do look amazing, so romantic looking! Congrats on your new Etsy Shop...I know you will do well! You had me at "no sew" Maria elena! I have been planning to put outdoor curtains in my gazebo but have yet to find the time, this is perfect, your space now looks so much grander and cozier! love it! Maria Elena, what a wonderful idea, I love the curtains you made, and your porch looks so pretty. No sew, and good after five years is amazing. Have a great day. I really love your curtains...they look fabulous. Hi Maria! Your curtains look wonderful and you did a great job on figuring out how to hang them. So lovely! Where did you find the iron rods? Wow - great idea - I'm going to Lowes to get me some drop clothes right away. Love your photos of your deck, it is wonderful. Those are absolutely fabulous and worth all the work that went into them!! These are gorgeous, and you did such an amazing job! I am pinning these to a few of my favorite boards. Beautifully done. You did a great job...lot of work but well worth it! They add a touch of elegance to your back deck. A very charming project with beautiful results. This is one awesome thrifty idea...thanks for sharing it at my party. Come by and grab my featured button for your blog...yes...you will be featured at Nifty Thrifty Tuesday on Monday. These turned out so nice! Thank you for joining Home Sweet Home! This is just gorgeous! I love it! I've always loved your patio. The curtains are great....they add such a softness to a hard space. Such an inviting space! I love the curtains! I really like that outdoor space, it is vital to have a good patio area to enjoy this wonderful weather. This was a smart use of the dresser as well, very good fit for the television. I love the color of the bench as you did, I enjoy cooler colors in the spring and summer. How gorgeous! Thank you so much for sharing at Redoux! Absolutely beautiful--and I love that the curtains are no-sew! I featured you at Grace at Home--thanks so much for joining! You did a fab job. Draperies do add a touch of warmth and coziness to any space. I've been wanting to make some outdoor curtains for years. Thanks for showing us how your turned out, nicely done! I like the chain tie-backs I just finished putting drop cloth curtains on my pergola and I was thinking rope tie-backs but the chains are really attractive. I am so glad to hear that your curtains have lasted so long. Thank you for sharing! This is just the type of blog I like to read. 5 years? It seems like you made curtains sturdy enough to withstand unfavorable weather for that long of a time. It sure did take a lot of time to make them considering that you made eight large curtains. But, as you can see, the results are undeniably good. I hope you make more projects like this! How do you keep them from getting moldy? Pam, I did do anything special for that, so far, no problem with mold. 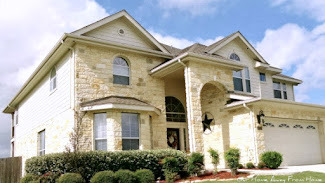 Thanks for sharing outdoor curtain images and information. This is brilliant! We've been tossing around where to get the panels and this solves our problem and saves a ton of money!!! Thanks for sharing!